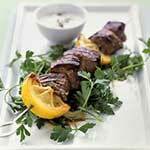 Although this recipe is for lamb, a tender cut of beef will also be delicious. In a bowl combine together all ingredients and mix well. Refrigerate until ready to serve. A variation of this recipe uses dill instead of parsley and omits the mayonnaise.